Relegation-threatened Blackpool were pegged back as Danny Mayor's equaliser earned Bury a draw at Bloomfield Road. The hosts went ahead after 74 minutes from a Danny Philliskirk penalty after Cian Bolger upended Jim McAlister. But the Seasiders' lead lasted just two minutes before the Shakers equalised when John O'Sullivan's cross found Mayor, who slotted home from 12 yards. Blackpool remain two points above the League One relegation zone, while Bury stay in 15th place. "Delighted with that point today, certainly after going 1-0 down to the penalty. There was only one team that wanted to win it first half. "I'm delighted with the character and resolve shown"
"It's all credit to the players." Match ends, Blackpool 1, Bury 1. Second Half ends, Blackpool 1, Bury 1. Corner, Bury. Conceded by Luke Higham. Foul by Joe Riley (Bury). Substitution, Blackpool. Martin Paterson replaces Jacob Blyth. Attempt saved. Ryan Lowe (Bury) right footed shot from outside the box is saved in the top right corner. Cian Bolger (Bury) wins a free kick in the attacking half. Attempt saved. Bright Samuel (Blackpool) right footed shot from outside the box is saved in the bottom right corner. Attempt saved. Danny Philliskirk (Blackpool) left footed shot from the centre of the box is saved in the centre of the goal. Bright Samuel (Blackpool) wins a free kick in the defensive half. Goal! Blackpool 1, Bury 1. 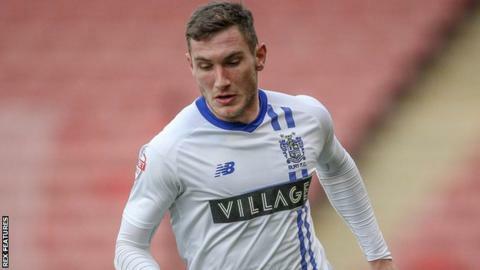 Danny Mayor (Bury) right footed shot from the centre of the box to the bottom left corner. Assisted by John O'Sullivan with a cross. Goal! Blackpool 1, Bury 0. Danny Philliskirk (Blackpool) converts the penalty with a right footed shot to the bottom left corner. Penalty Blackpool. Jim McAlister draws a foul in the penalty area. Penalty conceded by Cian Bolger (Bury) after a foul in the penalty area. Substitution, Blackpool. Mark Yeates replaces Mark Cullen. Attempt missed. Tom Soares (Bury) right footed shot from outside the box is just a bit too high. Luke Higham (Blackpool) wins a free kick on the left wing. Substitution, Bury. Joe Riley replaces Craig Jones because of an injury. Attempt saved. Chris Hussey (Bury) left footed shot from outside the box is saved in the top centre of the goal. Substitution, Bury. Ryan Lowe replaces Danny Rose. Attempt blocked. David Norris (Blackpool) left footed shot from outside the box is blocked. Foul by Craig Jones (Bury).